Coyote with Specter air intake - how/where to connect PCV and CMCV hoses? Thread: Coyote with Specter air intake - how/where to connect PCV and CMCV hoses? The Coyote instructions for the Specter Air Intake make no mention of attaching the left side PCV hose or the CMCV vacuum connector, but show barbs for both on the Treadstone air intake. 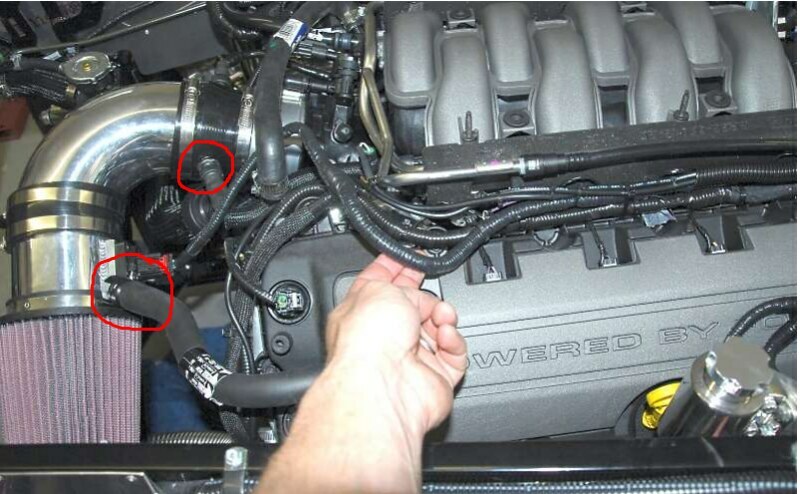 Later in a different section of the instructions, there is a photo of the Specter Air intake with both of these hoses connected (I think). 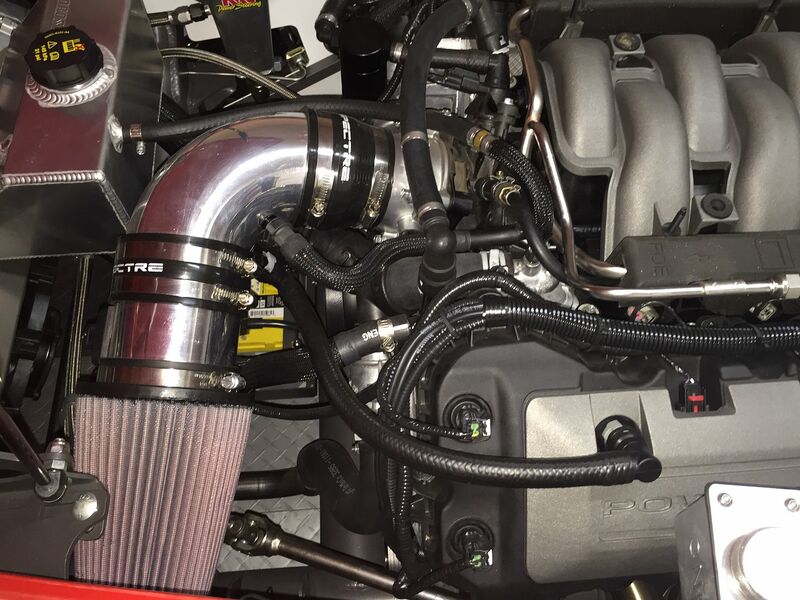 Do some sort of fittings have to be fabricated to get these hoses onto the Specter intake? Can someone point me to a good solution? Last edited by shark92651; 09-12-2018 at 09:24 AM. PCV: I more or less duplicated the PCV location of the stock Mustang intake by putting it in the 90 degree Spectre tube. It's not real easy to see in the picture linked below, but it's the best one I have. The PCV hose is the one on the bottom. Not the one nearest the camera. The connector fitting is available from JLT. You can call and they'll get one to you. I have the part number, but understand it changed. Just explain what you need and they'll know what it is. Drill a hole in the tube and the fitting goes into a supplied grommet. Then the factory connection snaps right on. Factory Five used to have a section in their instructions about "relaxed emissions" and didn't route the PCV line to the intake. Just vented it to atmosphere. Some put a small filter where it exits the head. You may hear from some suggesting that approach. Factory Five has removed this from their latest instructions. Last edited by edwardb; 09-12-2018 at 06:06 AM. Thanks. Paul in your pic it looks as if you have 2 fittings on your 90 degree tube, is this correct? If so, where is the other one going? Update: Ok I spent a bit of time looking over the thread you linked to. Am I correct that in the 2017 version of the Coyote this connection was eliminated? Last edited by shark92651; 09-12-2018 at 09:53 AM. Thought I explained that, but didn't do a very good job I guess. Yes, the picture has two connections because it's a 2015 create. But only one (the bottom one) is the PCV line you are asking about. The other one is the CMCV vent that was eliminated on your 2017 version. So you won't have that one. Correct. But just to be 100% clear, the 2017 eliminated the vent to the intake (now goes directly to atmosphere at the back of the engine, as I mentioned) but you still need the vacuum source line. Otherwise they don't work. The vacuum connection is unchanged between the early and later versions. Last edited by edwardb; 09-12-2018 at 01:25 PM. Al, in this post you mention you found parts to modify the PS hose that goes to the vacuum reservoir so it can easily plug into the vacuum port connection above the intake. Do you have details on what you used? Thought I explained that, but didn't do a very good job I guess. Last edited by shark92651; 09-12-2018 at 09:07 PM.